In a rush to get homeowners insurance? You shouldn’t be. Just like finding the best deal on a new car or scouring the latest grocery bargains, you’re going to want to exercise some careful due diligence and shop around a little bit. After all, for most people, their home is the most expensive and valuable asset that they own. Therefore, it would only make sense to protect it by securing the right homeowners insurance policy. Now, take comfort in the fact that you don’t have to navigate the home insurance market alone — that’s why Bradley’s Insurance is here! We can help you find the ideal coverage that matches your home’s value, the type of home that you own, where it’s located, the age of your home, and other relevant factors. Get started with our Ottawa home insurance brokers by visiting here. Below, the experts in homeowners insurance in Ottawa are going to cover some of the most common mistakes that people tend to make when shopping for the right homeowners insurance policy. We like to think that this is particularly useful information because, more often than not, it’s as valuable to know what not to do as it is to know what to do. Anyway, let’s take a look. In short, don’t do this. From a frugality standpoint, getting the least amount of coverage seems like an attractive option because you’ll have money. However, should disaster strike, you’ll be dealing with quite a financial headache. It’s generally recommended that you buy enough coverage to be able to completely rebuild your home and even replace all of your possessions if they were lost in a fire, flood, tornado, and so on. Here’s a not-so-fun-fact: most homeowners insurance policies do not include flood protection. Flood insurance usually covers your property and the contents inside of your property against storm surges and flooding during events like torrential downpours, hurricanes, and tropical storms. One of the last things that you want is to think that you have flood insurance, only to realize that you’re out of luck when the rain comes. Though reducing the amount of coverage that you get with your home insurance provider in order to pay less per month in your premium sounds like a good idea, it’s not. You’re just leaving yourself at a greater risk of paying for future home damage out of pocket. To save money and maximize your policy value, consider preserving your strong, comprehensive coverage and raise your deductible. This way, your premium will remain low, all while maintaining coverage that’s going to be there for you and your home when you need it the most. Don’t make this mistake! For instance (and this is a pretty common instance for all of you renters out there), if you’re renting your home via a private landlord and you experience a loss with your personal property inside of the house, your landlord’s home insurance policy would not cover your items. As a tenant, always make sure to have a renter’s insurance policy in order to cover your personal property and liability. Did you know that your home’s occupants help determine what kind of homeowners insurance policy you’ll need? A growing family calls for a different home insurance policy as opposed to a younger couple. In other words, who is living in your home will directly determine the type of policy that you should be holding. Additionally, there are different homeowners insurance policies for people who own and live in their home as opposed to those who own a home that they are renting out to other occupants. There are even specialized home insurance policies for those who own a home that no one lives in (why this would be the case is beyond us). In certain instances, your home insurance claim won’t be validated or covered if you have the wrong type of policy relative to the occupants of your home. Make sure that your occupants match what’s covered on your policy, and if there are any occupant changes, modify your policy immediately and accordingly. It’s important to know what “Actual Cash Value” concerns. When your home goes through an unfortunate loss, the Actual Cash Value will only provide you with reimbursement for the “book value” of the particular item in question. This means that an old piece of furniture or a laptop would be worth next to nothing when it comes to getting reimbursed. However, “Replacement Cost” would mean that you’re getting a brand new replacement of a particular item without respect to the depreciation of said item. Having been well-established in Stittsville and Ottawa for decades, Bradley’s Insurance enjoys what we do best: connecting the right people with the right insurance policies. To us, it really is that simple. 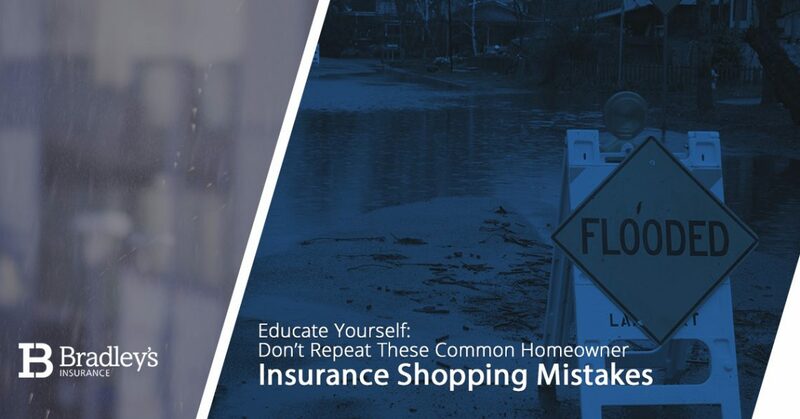 When it comes to shopping for the right home insurance policy, hopefully the above information helps clearly illustrate what you shouldn’t do. As for what you should do, we highly suggest that you contact Bradley’s Insurance to speak with our friendly and qualified insurance agents. Visit here to get started!